Bell a lasting tribute to Sisters. MORE than 150 people gathered on February 1 at St Joseph’s Church, Murgon, for a Thanksgiving Mass for the 77 years of service of the Presentation Sisters to the parish of Murgon. The departure of Sr Carmel and Sr Vianney has meant the Presentation Sisters will end their involvement in the parish. In his homily, parish priest Marist Father Michael Carroll said the arrival of the Presentation Sisters in Murgon in 1937 connected the parish with one of the great stories of Irish Catholicism, Venerable Nano Nagle’s concern for educating and caring for the poor of Ireland. 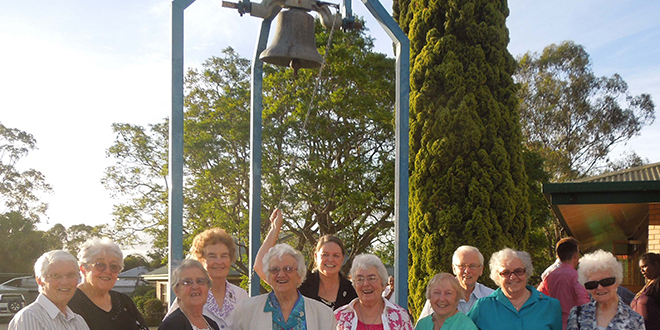 The Presentation Sisters brought their founder’s vision to Murgon. After the Mass the school bell, which had been used in the parish for many years, was renamed the Presentation Bell. The bell is now located in front of the parish church. After the blessing of the bell the congregation adjourned to the adjacent parish hall for dinner and speeches. Elaine Thompson, whose family has had contact with the parish school for three generations, thanked the Sisters on behalf of the parish. In her speech she mentioned the Sisters came to Murgon in 1937 to found St Joseph’s Catholic Primary School. For 17 years they also staffed St John the Baptist School at Wondai. To ensure the children in isolated parts of the parish were properly prepared for the sacraments they instituted the summer school in December. The Sisters also taught commercial subjects at night to help the young women of the town to gain meaningful employment. Councillor Kathy Duff, of South Burnett Regional Council, thanked the Sisters on behalf of the community. She also recounted her experience of the summer school. Aunty Daisy Carlo thanked the Sisters on behalf of the Cherbourg community for the support they gave the community in preparing children for the sacraments. During the dinner Rita Pratt, one of the earliest music students of the school, played the piano. In response the congregational leader of the Presentation Sisters Sr Kathleen Tynan told the gathering how much her congregation enjoyed working in Murgon parish. She also read the names of the Sisters who had worked in the parish. On January 31, St Joseph’s school had a liturgy of Thanksgiving for the work and presence of Sisters Vianney and Carmel.